At ACS, we don’t like to toot our own horn too much. We’ll an make exception though. In this case, we’re tooting/honking the horn of a luxury charter bus. Our longtime client Trailways recently launched their new website. And we must humbly say, the site is as fully loaded and impressive as the buses themselves. Our team knew from the start that this would be our most ambitious website ever. We knew it meant telling the story of a beloved household brand. We knew it meant bringing over 65 independent companies under one digital roof. We knew it meant fielding customer requests from across the country. Knowing all of this, we still took the bus by the wheel, so to speak. We got to work. Trailways has been an ACS client for over 10 years, and we were eager to help propel their brand to the next level with the new website. Luckily, Trailways headquarters could not be closer. They work just downstairs, so we collaborated closely with their team throughout the project. We’re excited to share some fun features of the new website, and hope it helps your travel plans too. For over 80 years, Trailways has connected independent charter bus companies nationwide. Their charter bus network extends into Europe and Canada, and together their members serve thousands of groups each year. Trailways also sells individual bus tickets for a variety of U.S. cities. The new website supports charter groups and one-off tickets alike, thanks to our custom booking engine. On the site’s homepage, our designers created a simple form where visitors can quickly request the information they need. Whether you want a single ticket or buses for 100 people, it takes less than a minute to start your trip research. ACS developers also built a custom system for charter bus companies to track and manage incoming leads. 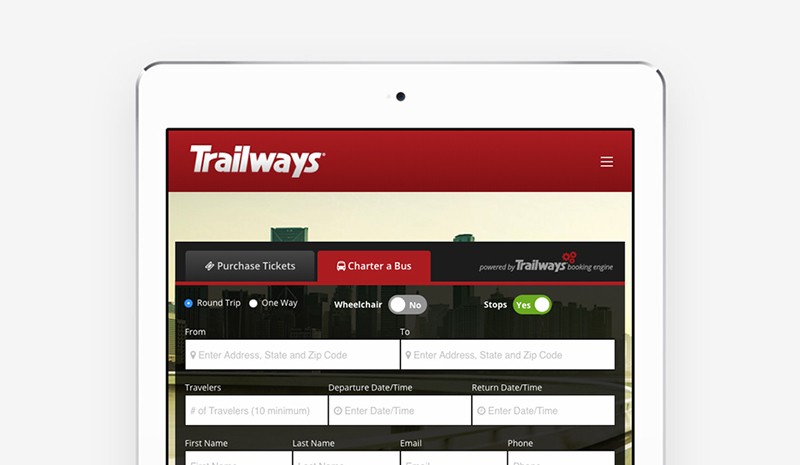 This booking engine makes life much easier for every Trailways employee. Each time someone wants to book a group trip, the system automatically routes the request to the right company based on the customer’s location. Before the new website, Trailways managed these customer inquiries manually. Now, it’s a smooth process with an easy-to-use online dashboard, branded emails and detailed customer analytics. Though Trailways is a single and storied brand, the network includes over 65 member companies. Each with its own buses, processes, regions and customers. The new website needed to represent each member, while keeping a cohesive look and feel. Having these goals in mind, we designed individual profiles for the member companies. The profile pages showcase each company’s strengths, educating interested customers with friendly graphics. With helpful bus icons, customers can scroll through the company’s fleet of motorcoaches. From full-size luxury coaches down to minibuses, you learn the full scope of travel options in seconds. Curious travelers can also read the company’s short bio, services and amenities — all helpful insights for trip planning. Each profile has a consistent format, so customers never feel confused as they navigate the site. But charter companies can customize their profiles with images, text and icons. To edit the webpage, staff simply log in to their backend account. This portal also connects charter companies to the booking engine. So they can edit their company profile, connect with potential customers and track incoming leads — all in one convenient online portal. Searching for transportation also means exploring different destinations. On the new Trailways website, you can learn about popular hubs throughout the country. Cities have custom Destinations webpages, beautifully designed to encourage travelers to visit. You can learn all about the city’s sights, attractions, and restaurants. The pages also guide you to hotel discounts and local bus stations. Like the rest of the Trailways website, this section helps make trip planning easy and enjoyable. Trailways started with over a dozen destinations on their new site, but we made sure they have room to grow. Our developers built an easy-to-use template, so Trailways staff can quickly add new cities, without needing to know how to code. Thanks to our wonderful partners at Trailways, the new website is off to an amazing start. We can’t wait to continue our journey with the company. Have an Ambitious Site on the Horizon? Your website should help your whole company run like a well-oiled machine. Let us build a highly functional website that exceeds your expectations.